The small city of Mecca, California has some of the hottest summers on the planet. Our record high of 126 degrees is as high as they come in Coachella Valley and San Bernardino. What if I told you that the risk of flood and water damage is just as high in Mecca, California, as it is in beach cities around Southern California? The truth of the matter is that flood damage originates from broken pipes more than rainfall. The expert cleaning and restoration technicians at Superior Cleaning and Restoration Inc. have dealt with wild stories of flooding and water damage, but these experiences give us the edge to offer superior service. Our technicians are trained to handle your water damage cleanup from beginning to end. That means that we will be there no matter what is necessary to restore the property to a superior condition. From dry out remediation, to reconstruction and remodeling, our experts can handle the job. Call now. It doesn’t flood in Mecca, California, why should I worry? Nature does not flood Mecca often, but it has in the past. The main flooding to be concerned about is from within. Water pipes bursting, fire hydrants breaking, big rigs crashing, fire emergency systems malfunctioning, and even pranks gone wrong can cause flooding and water damage. I don’t have insurance, can you help with my water damage cleanup? Yes. We work with many major insurance companies, and we will work with you if you do not have insurance. 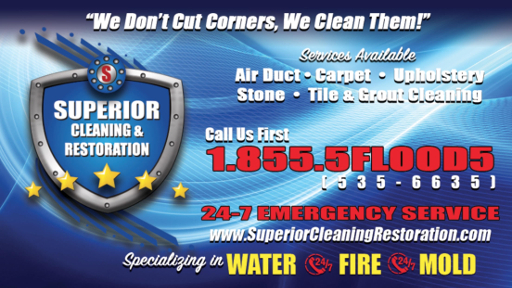 Superior Cleaning and Restoration Inc. is an all in one shop for cleaning and restoration. We will work with you to figure out an affordable plan to restore your property. Are you a business owner in Mecca, California worrying about what to do about flood and water damage? Stop worrying, pick up the phone, and call the experts at Superior Cleaning and Restoration Inc. We are here 24/7 to help you with all your water and flood damage emergencies. You can rest easy knowing your property is being restored by the expert cleaning and restoration technicians at Superior Cleaning and Restoration Inc. We will cover your property from the moment your damage is detected, until the property is back to a superior state. Call us now.